Talking about the disadvantages of aerobic exercise is like talking about the disadvantages of hugs -- it's hard to imagine there are any. Aerobic exercise is the cornerstone of a healthy lifestyle, in addition to eating a healthy diet, strengthening your muscles, getting enough sleep and reducing your stress level. When performed regularly, aerobic exercise can lower your risks for a wide array of physical ailments. 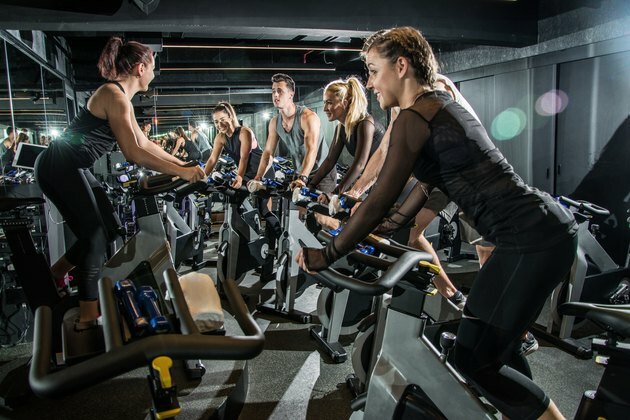 That being said, there are a few instances in which aerobic exercise -- or certain types of aerobic exercise -- can be risky or exacerbate health conditions. Aerobic exercise varies in intensity from moderate to vigorous. Moderate-intensity aerobic activities include brisk walking and bicycle riding on level ground, as well as activities such as mowing your lawn. They are typically low-impact, meaning they don't put a lot of pressure on your joints. Common vigorous or high-intensity activities include running, jogging, bicycling on hilly terrain, swimming laps in a pool and participating in singles tennis. These activities are more taxing and higher impact, putting heavy demands on your lungs, heart and joints. If you have a health condition that makes it disadvantageous or dangerous to exercise, your doctor has probably discussed it with you. Heart conditions like heart disease and heart murmur sometimes prohibit people from doing aerobic exercise, especially vigorous activity. If you've displayed symptoms of chest discomfort or pain, if you have difficulty breathing with mild exertion, if you feel dizzy or faint from exertion and if you have ankle swelling or a rapid heartbeat, these are all symptoms that can make exercise dangerous. Your doctor is the only person who can tell you if aerobic exercise is safe based on your condition. Musculoskeletal problems may also make aerobic exercise more difficult and painful. When there is inflammation in a joint or muscle, aerobic exercise can exacerbate and worsen it. You should never do cardiovascular exercise when you are feeling pain. Being significantly overweight makes many types of cardiovascular exercise unsafe because of the pressure it places on already taxed joints. Obese people should talk to their physicians about the best type of exercise, but typically they should avoid anything high impact such as running or jumping. Read more: How Long Should a 45-Year-Old Do Aerobic Exercise? Properly planned aerobic exercise programs match your level of exertion with your current level of experience and physical fitness. If you are in your 40s or older, have little exercise experience and lead a largely inactive lifestyle, participation in a vigorous aerobic program can tax your abilities and increase your chances for mishap or injury. In some cases, the presence of a specific physical disability may also significantly limit your ability to participate successfully in an aerobic exercise program. In these cases, vigorous high-intensity, high impact aerobic exercise programs can be dangerous. However, generally anyone who is able to move is able to do some sort of aerobic exercise. Even those who are wheelchair-bound can engage in forms of aerobic exercise. Individuals without specific health problems can typically participate safely in an aerobic exercise program that aligns with their current abilities and experience. However, you may have other conditions or circumstances that make aerobic exercise unsuitable. Consult your doctor before you start exercising. Also, let him know if you experience any problems once your program is underway. In some cases, your doctor may require you to undergo specific testing procedures before approving you for exercise. Centers for Disease Control and Prevention: Physical Activity For Everyone; How Much Physical Activity Do Adults Need? Is a Heart Rate of 182 While Running Dangerous?